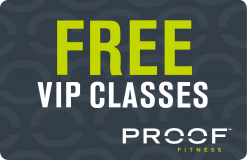 At Proof Fitness, we provide world-class facilities with a five-star concierge service that exclusively focuses on our members. Here, it’s all about your experience, safety and results. Whether you’re a beginner or a professional athlete, we want to help you achieve your goals. We combine fitness programs with nationally-recognized studio formats tailored for each individual’s fitness level. In this fitness community, we inspire each other to achieve exceptional results and help you become the healthiest, happiest and most productive version of yourself. I give proof fitness 5 stars! I will have to say this club is pretty awesome. Customer service excellent and it's super clean, I've been working out for years and this is by far my favorite gym. I felt comfortable the first day I started. I especially like Erin's TKO class and thanks to Tony Sandoval for upping my golf game. Pretty cool I can work out and enjoy the sauna and a massage at the spa. I highly recommend Proof fitness! I recently toured Proof Fitness at Tates Creek and I couldn't be more please with the facility! The management and professionalism of the staff, especially Jackie is Top Notch! Very clean and very well managed! Looking forward to joining Proof at Tates Creek! I have been a member for over 2 years. My health insurance recently changed to Humana which has a fitness plan that earns points for gift cards. Haeleigh Cook was able to enroll me in this program through Proof so I could start earning points. She knew exactly what the program was and now all my workouts and training sessions will be recorded and I will earn points for all my hard work! I was very impressed with Haeleigh's knowledge of the program. I have been a member of Proof Fitness for over 2 years. My personal trainer is Tyler Capps and he has helped me improve my health and lose weight. I am always greeted by staff and look forward to my gym time! I highly recommend this gym for all your fitness needs. Best facility and variety of equipment of ANY gym. Friendly employees and trainers make you feel comfortable and welcome. 10/10 would recommend to anyone, of any fitness level! Ive been looking for a gym for several years in Lexington and have finally found my home. Proof fitness is by far the best I have found. Not only are there facilities top notch I have a great experience with their trainers. Especially Tony and Lydia, they always take the time to stop and take an interest in their clients. I would highly recommend this gym No matter if you are a beginner or advanced in your fitness journey. Been a member here for over a year and have nothing but great things to say! It's a very upscale gym with lots of amenities. The staff and trainers are always super friendly and welcoming. The studio classes are great. You will feel right at home here!